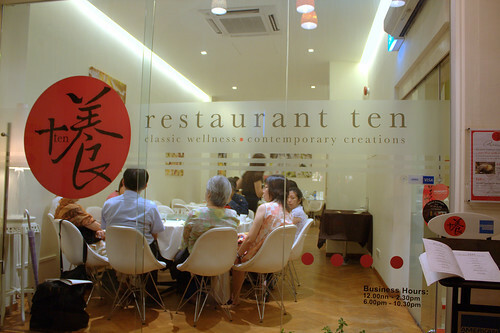 Formerly known as Metropole Herbal Restaurant, it has now been renamed and given a new lease of life in the form of Restaurant Ten. The concept of Restaurant Ten is simple, to provide consumers with tasty yet nutritional healthy food. 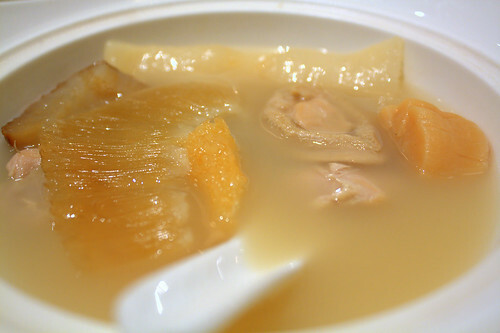 The menu is pretty extensive, with a range of Seafood (Sharksfiin, Abalone, Sea cucumber, Fish & Prawns) & Nutritional Soups (interesting ones include Crocodile Soup), along with the standard Chinese Restaurant fare, but of course every dish has been specially tweaked with a healthy twist. 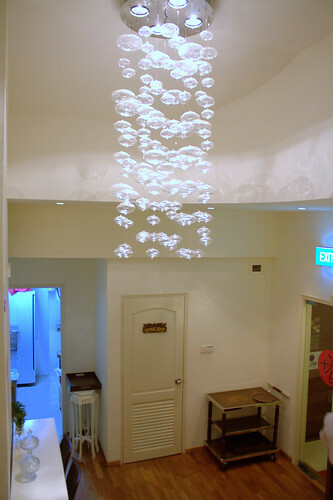 The restaurant occupies 3 storeys and I spotted an interesting-looking chandelier on the 2nd storey. The first storey is usually left for groups with elderly so if you are young and able-bodied, you will probably be seated at the second storey. The third storey has only 1 large table, to cater for a large group that wants privacy. Though the second floor was totally empty when I first arrived, business picked up later on. Apart from the ala-carte menu as mentioned earlier, there are also several set meals available, ranging from $28++ for the express lunch set meal to the extravagant $88++ for the Braised Abalone and Sea Cucumber Set Menu. I had the $68++ 6-Course Mini Buddha Jump Over the Wall Set Menu. Instead of the normal steamed peanuts, mixed nuts or pickles, Restaurant Ten serves an appetizer involving Pumpkin with Passionfruit, which at first I thought it was pickled unripened Mango or Papaya, very very unique indeed. 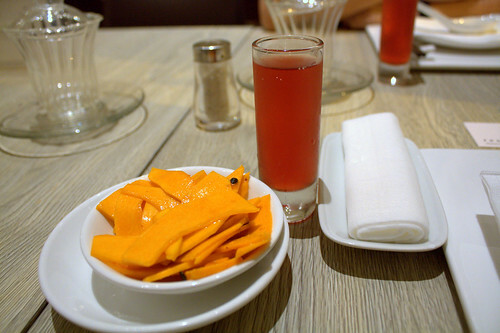 We were also given complimentary shots of Hawthorn Juice to stimulate our taste buds and aid digestion. I ordered the Lychee Tea($3.80++) expecting to get some icy cooling hawker centre style Lychee Tea so I was quite surprised that the Lychee Tea here is actually hot tea made with Lychee Leaves from Taiwan in the teabag. I was actually able to taste the subtle hint of lychee and smell it’s fragrant aroma, so I thought this was quite special quite coolio. Dad got the Pu Er Tea($3.80++) while Mum got the Hawthorn Juice($4++). 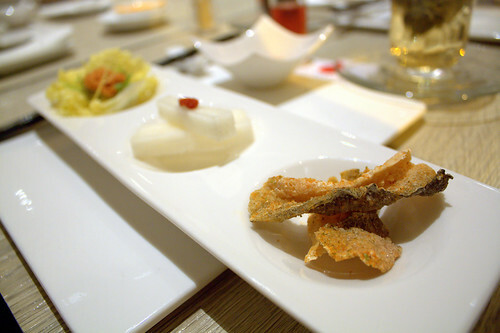 The meal officially started with the first course – House Special 3-Combination Starters consisting of Deep Fried Fish Skins, Japanese Yam & Crispy Fish Roe over Avocado. The Fish Skins were well marinated, brittle and devoid of any excess oil, definitely the best fried fish skins I have had to date! Wasn’t too fascinated by the Japanese Yam because it was like eating a stickier version of white radish. Dipping it into the side of honey and blended wolfberry dip made it slightly less bland though. I’m not really an avocado person but I thought the Fish Roe over Avocado wasn’t too bad. 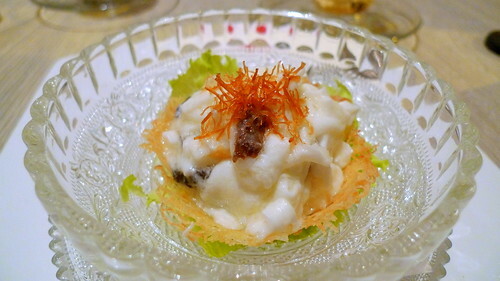 2nd Course was the Egg White with Morel Mushroom and Dried Scallops in Potatoes Nest. The potatoes nest reminded me of rosti, though far thinner and crispier. The egg whites were smooth and creamy but remember to add a dash of apple cider over it though, it does help to boost the flavours. 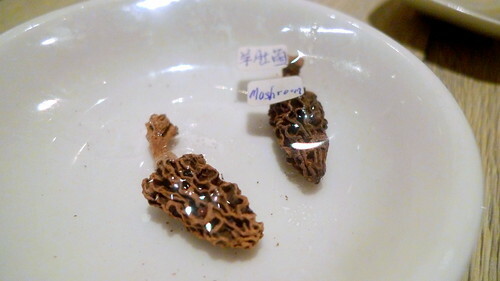 As the captain kindly showed me, this is what a morel mushroom looks like. 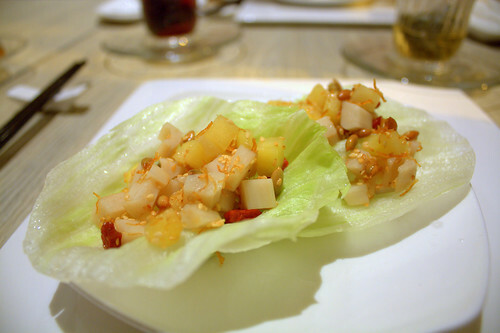 Third Course was the Apple and Lotus with Fresh Cabbage.Though the ingredients are simple, a closer inspection proved that there are some complex flavours at work here with additional sweetness exuding from the wolfberries, as well as additional crunch from the sunflower seeds, dried scallops and sesame seeds. Almost entirely vegetarian, I’m so unused to eating so healthily! The highlight of our dinner – The House Special Mini Buddha Jump Over the Wall! I was a little let down since the previous courses definitely didn’t justify the pricetag of this set meal but upon seeing such a large bowl of soup, yes the price is definitely justified. 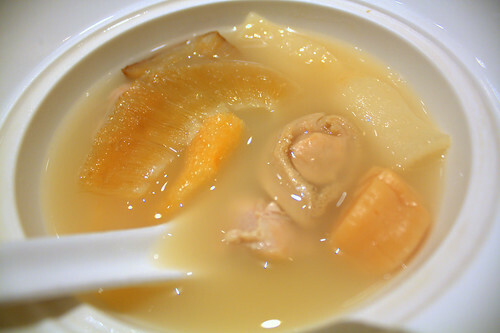 The standard Buddha Jump Over the Wall ingredients such as Abalone, Sea Cucumber, Fish Maw, Sharksfin, Dried Scallop, as well as pieces of chicken and a large slab of pig’s tendon. With so many seafoods and meats in one bowl, it’s no wonder it was saturated with umami goodness. 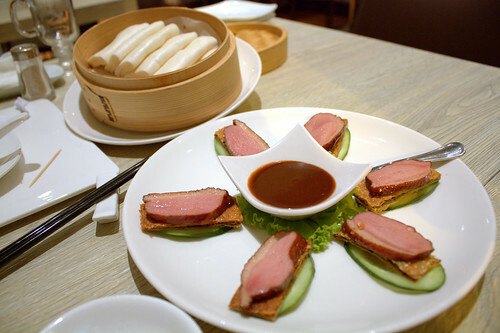 Mix a kong ba pao and peking duck and you get this – The Smoked Duck with Crispy Seaweed Beancurd (served with buns) which I ate with a gentle smearing of Hoisin Sauce. 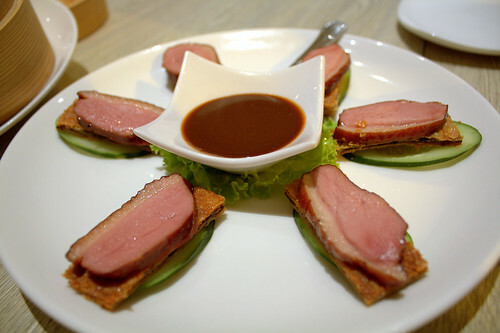 Instead of a crispy duck skin, what I encountered instead was the crispy seaweed skin which was just as well. Decent but not jaw dropping, I might have preferred a Peking Duck over this smoked one. 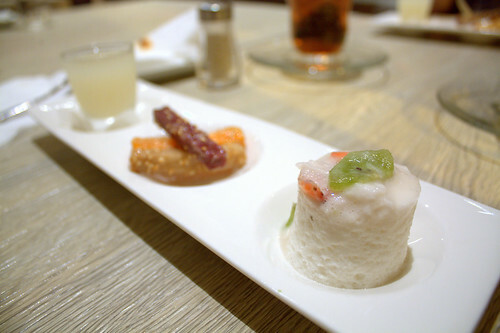 Finally, the last and final course – The 3 Combination Desserts. Advice from the captain is to start from the rightmost dessert which has the mildest flavour followed by the middle and leftmost one. The rightmost dessert is a Coconut and Egg White Moose. Mildly sweet, I love the gentleness of this pudding which was very light on the palate. 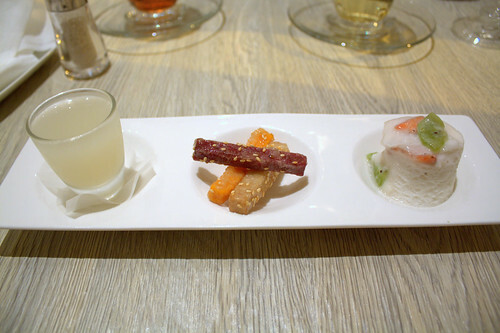 The middle dessert is the Fried Japanese Sweet Potatoes. This is actually my favourite of the 3, it is somewhat denser than a french fry, and the crisp exterior is savoury while the interior is sweet and so it strikes a good balance. I ended off the meal with the pulpy Blended Pear Juice. You know the feeling you get usually after a heavy chinese meal where your throat still seems parched even after cups and cups of tea? You will never get it at Restaurant Ten, the foods here are just done so naturally with little artificial flavourings and I’m sure there’s no MSG involved. 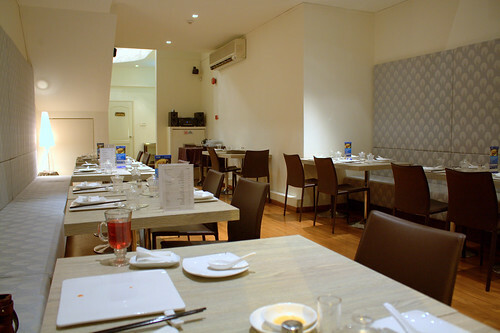 A great place to bring your older relatives and friends for a meal! 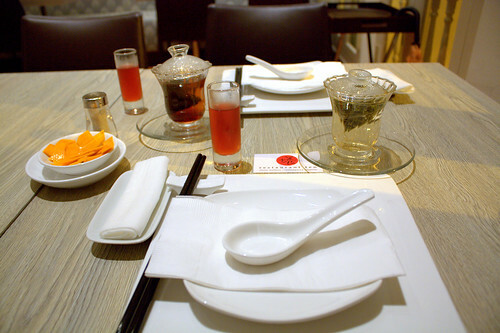 Categories : All YumYums in my TumTum, Bugis, Chinese, Cuisine Type YumYums, Location of YumYum, Yummy! my pleasure! Thx for dropping by!